An extensive vaccination campaign across 19 West and Central African countries is to begin today in an attempt to stem a year-long polio epidemic in the region. The United Nations and international aid agencies plan to immunize 85 million children under five. More than 400, 000 volunteers and health workers will take part in the campaign, visiting children in their homes. 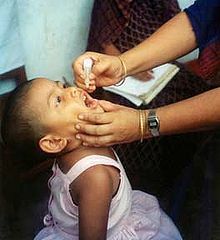 The current polio epidemic has been going on for a year and there have been outbreaks in the last six months in Burkina Faso, Cameroon, Chad, Guinea, Liberia, Mali, Mauritania, Senegal and Sierra Leone. These countries will be the focus of the campaign, along with Benin, Cape Verde, Central African Republic, Côte d’Ivoire, Gambia, Ghana, Guinea-Bissau, Niger, Nigeria and Togo. Efforts last year failed to halt the disease because not enough children were vaccinated. The program failed in part because local religious leaders told parents that the vaccines would sterilize their children, or cause AIDS. As well as targeting more children, today’s campaign features better training for volunteers. Vaccinations will be repeated on 26 March in the six key countries, and again on 24 April for all 19 countries involved. The campaign is funded by Rotary International who have provided $30 million. In 2009 the World Health Organization reported that approximately 1,600 children were paralysed by the virus worldwide.